I didn’t realise how much rice I had been eating until I thought about the last time I ate pasta or potatoes and I can’t remember when that was. I like rice as a plain side to something, a herb encrusted rice salad or as a risotto. This quick and easy rice dish (or a cheat paella) is not a paella by any means but it’s a great dish to knock up after a hectic day with a nice bit of chorizo for a mid-week Spanish pick me up. Get out your flamenco. Add the oil to a large frying pan on a medium heat and add the onion. Fry until softened then add the chorizo and garlic and fry until the chorizo is nice a brown. Add the mushrooms and fry for a few minutes more. Add the rice to the pan and give it all a good stir. Pour in the stock, bring everything to the boil and simmer, lid off, for around 15-20 minutes. Add the peas for the last 5 minutes of cooking. When it’s nearly ready add a good helping of black pepper and then taste it to see if it needs salt; the chorizo and stock may have added enough salt already. I love how comforting this is but the colours and lots of vegetables keep it vibrant and a little healthy too. I also really like how there’s no stirring needed and very little washing up too. This also lends itself really well to being a vehicle to use up whatever bits you have in the cupboards and fridge. Sound too good to be true? Try it and see. We are big eaters of rice, almost every day and for almost all meals. Nice and simple rice dish, some sort like our local fried rice too. mmmm a possibility for Thursday evening, I also have some tiny prawns in the freezer. I could add them to it. Have you seen those little tiny “Snacking Chorizos” that you can buy in supermarkets these days? You get about a dozen of them in a small pack. They are great things to have in for those occasions when you need just a small quantity of something spicy. (Like your rice dish). They can be kept in the freezer too, so that you can use just one or two when required. We love rice! And this is close enough to paella for me. 😉 Good stuff – thanks. 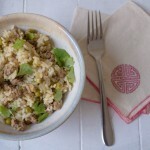 I love one dish meal, especially when rice is involved…looks fabulous Caroline. I eat a lot of rice, too! Love ride dishes and this one looks awesome. I eat so much rice too, much more than any other starch. I have all the ingredients to make this dish so I think I will try it out. Haven’t had a Paella in ages! True, a lot of people tend to think only certain things go well together, but we’re often surprised with the new combination of food/baked goods. That’s why cooking is fun and full of surprises. 🙂 Your one pot paella looks yummy! I love making an easy paella dish. I brought back some paella seasoning from Spain and that really livens it up too. un plato colorido y sabroso me gusta la paella,abrazos. hi caroline, rice is considered staple food here and i eat rice almost every day, if not then it will be noodles..this easy paella sounds simple and tasty! Love to use frozen peas in my stir-fried rice too. This is ever so tasty. I love paella…and this lovely shortcut version will surely delight my family!! Colorful and full of flavors, lovely recipe! I love one pot meals, meals with a bit of meat for flavor (not a giant slab overpowering the plate) and all types of rice. This dish hits all of my notes, and looks lovely while doing it. It’s so refreshing to see someone not just say add salt, but check. As someone who finds salt over powering in so many dishes, this is great. 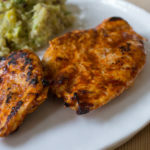 I found this recipe while looking for something new and different to cook for my family. I had never tried paella but liked the sound of this. as I am vegetarian I left out the chorizo but forgot to add anything vegetarian so mine was a bit blander. 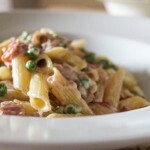 my husband and children loved theirs, they said lots of flavour it made masses, we had left overs.